The next generation Phone from Apple, most likely iPhone 5, has generated more rumors and conspiracies in 2 months than Area 51 has in decades. Forget the hearsay and hear what we have to say! OK, it’s still hearsay, but at least we have taken the time to weed out the improbable so you don’t have to. Apple is keeping tight-lipped as always so Team Stack scoured the net for all iPhone 5 rumors possible to deliver this succinct consensus. Here is what you should reasonably expect from the latest iPhone when it launches on September 21st, or, ugh, sometime around then. Thinner Screen– Apple was awarded a patent for a new touch-screen technology that would move touch sensors into the actual display as opposed the sensors sitting above the display. There is speculation as to the exact width, but it’s safe to say it should be significantly slimmer. Taller Screen- If you have seen any “leaked” images you have probably noticed the predicted 1/2 inch longer screen. Some claim the height and width dimensions will remain the same despite the taller 4″ display; though most speculate it should grow taller so don’t hold your breath. Bigger Battery– This rumor looks to be widely accepted which would support the increase in length claim. Something must juice that larger brighter display of the fastest iPhone yet. Also seeing some whispers about longer battery life; something a larger battery could lead to as well. Smaller Dock- Currently the iPhone has rocked the 30-pin dock since the beginning (you know, that white iPod USB connector). Rumor has it Apple will drop to an 8-12 pin dock. The smaller doc leaves more room for the larger display and battery, but the days of using any Apple iPod doc in a charge-pinch will be missed. Again, everything stated above is speculation. Even the most credible sources are relaying contradicting rumors. We have simply tried to marry these ideas into a happy medium as a guide for reasonable expectations. 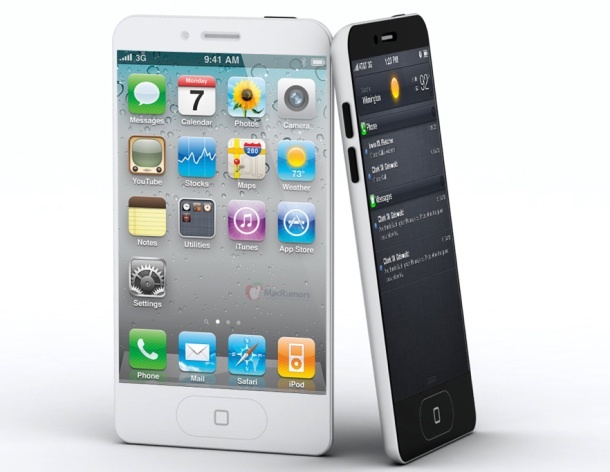 Overall it’s safe to expect the iPhone 5 release to greatly exceed the 4 to 4S jump. Stay tuned for Apple’s official release on September 12th, err, or, sometime around then. *Note: The iPhone 5 Rumor Filter will be updated as credible info leaks or widely accepted rumors develop until Apple officially announces the iPhone 5.